An effective protocol for the mass production of cauliflower microshoots was refined using the meristematic layer of cauliflower curd. After the meristematic layer was surface sterilized and shaved off, a commercial blender was used for homogenization and several blending treatments were tested in the range 15–120 s and 30 s was found to be optimal in terms of the amount explants produced and their subsequent growth ability. Explants were cultivated in S23 liquid medium (4.4 g L−1 MS (Murashige and Skoog) and 3% v/w sucrose) supplemented with several combinations of plant growth regulators (PGRs) including 1 and 2 mg L−1 of Kinetin in combination with three types of auxins (indole butyric acid (IBA), Naphthaleneacetic acid (NAA) and Indole-3-acetic acid (IAA)), each at 1 and 2 mg L−1 concentration. The use of 2 mg L−1 Kinetin and 1 mg L−1 IBA gave the best results in terms of its effects on explant induction. 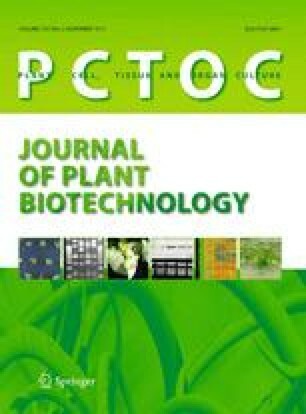 Microshoots of different sizes were encapsulated in a sodium alginate matrix and the optimal stage suitable for the production of artificial seeds was assessed in terms of both subsequent conversion and plantlet viability. The feasibility of cultivating cauliflower artificial seeds in commercial substrates (compost, vermiculite, perlite and sand) irrigated with different solution mixtures including sterilized distilled water (SDW), PGRs-free S23 medium and S23 medium supplemented with Kinetin (1 and 2 mg L−1) and IBA or NAA at (1 and 2 mg L−1) was investigated. The use of 2 mg L−1 Kinetin and 2 mg L−1 NAA applied with S23 gave the optimal response with both perlite and compost. This study showed high growth capacity of cauliflower artificial seeds in commercial substrates which is considered a promising step for their direct use in vivo. The authors gratefully acknowledge the provision of a PhD grant from the University of Damascus, Syria.